A major new development in battery technology promises to store more energy and allow thousands more recharges than with today’s cells. Though our cameras and production accessories continue to get smaller and more portable, trouble free batteries are still the stuff of dreams. Wherever we go, batteries and chargers are still a major consideration, with a constant need for recharging and maintenance. Battery manufacturers are very aware of the problem and have been working to develop better and longer lasting batteries. Improvement, however, has come very slowly. Labs throughout the world are constantly trying to improve batteries. 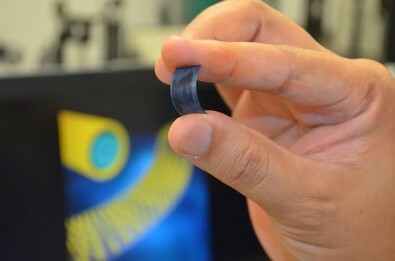 Now, scientists at the University of Central Florida’s (UCF) NanoScience Technology Center have developed a new process for creating flexible supercapacitors that can store more energy and be recharged more than 30,000 times without degrading. It is a development that could have a major impact on all kinds of batteries, from smart phones to video gear, and even electric vehicles. Anyone who uses a lot of batteries knows the problem. After 18 months or so, a battery holds a charge for less and less time as the battery begins to degrade. It happens to cells of all kind, shapes and sizes. Supercapacitor. Photos courtesy of the University of Central Florida. The use of nanomaterials to improve supercapacitors could enhance or even replace batteries in electronic devices. The problem is a stubborn one because in the past a supercapacitor that could hold as much energy as a lithium-ion battery would have to be much, much larger in size. The research team at UCF has joined others in experimenting with applying newly discovered two-dimensional materials only a few atoms thick to supercapacitors. Formulations with graphene and other two-dimensional materials have been used by a range of scientists, but with limited success. “There have been problems in the way people incorporate these two-dimensional materials into the existing systems – that’s been a bottleneck in the field. We developed a simple chemical synthesis approach so we can very nicely integrate the existing materials with the two-dimensional materials,” said Yeonwoong “Eric” Jung, principal investigator and an assistant professor with joint appointments to the NanoScience Technology Center and the Materials Science & Engineering Department. Jung’s team developed supercapacitors composed of millions of nanometer-thick wires coated with shells of two-dimensional materials. A highly conductive core enhances fast electron transfer for fast charging and discharging, while uniformly coated shells of two-dimensional materials yield high energy and power densities. UCF’s development is a breakthrough in battery technology. Scientists have long known that two-dimensional materials held great promise for energy storage applications. But until the UCF-developed process for integrating those materials, there was no way to realize that potential, Jung said. Cyclic stability defines how many times a battery can be charged, drained and recharged before beginning to degrade. Today, a lithium-ion battery can be recharged fewer than 1,500 times without significant failure. Recent formulations of supercapacitors with two-dimensional materials can be recharged a few thousand times. By comparison, the new process created at UCF yields a supercapacitor that doesn’t degrade even after it’s been recharged 30,000 times. Jung is working with UCF’s Office of Technology Transfer to patent the new process. In addition to Choudhary and Jung, the research team included Chao Li, Julian Moore and Associate Professor Jayan Thomas, all of the UCF NanoScience Technology Center; and Hee-Suk Chung of Korea Basic Science Institute in Jeonju, South Korea. A team of engineers led by 94-year-old John Goodenough, professor in the Cockrell School of Engineering at The University of Texas at Austin, has developed the first solid-state battery cells that could lead to safer, faster-charging, longer-lasting rechargeable batteries.